James Watson, who has been shunned by the academic community for his racist remarks, is putting his award up for auction. James Watson, the famed molecular biologist and co-discoverer of DNA, is putting his Nobel Prize up for auction. This sad final chapter to his career traces back to racist remarks he made in 2007, which led to his fall from scientific grace. Watson is best known for his work deciphering the DNA double helix alongside Francis Crick in 1953. The discovery revolutionized biochemistry and earned the pair and their colleague, molecular biologist Maurice Wilkins, the 1962 Nobel Prize in Physiology or Medicine. But in 2007 Watson made an incendiary remark regarding the intelligence of black people that lost him the admiration of the scientific community. Though outrageous, Watson’s statements were not his first comments to create a public outcry. He had a history of making racist and sexist declarations, according to Time. His insensitive off-the-cuff remarks include saying that sunlight and dark skin contribute to “Latin lover” libido, and that fat people lack ambition, which prevents them from being hired. To many scientists his gravest offense was not crediting Rosalind Franklin—his female collaborator—with helping him deduce the structure of DNA (while often sharing his distaste in her appearance). Reinhard wrote: James Watson, who has been shunned by the academic community for his racist remarks, is putting his award up for auction...This sad final chapter to his career traces back to racist remarks he made in 2007, which led to his fall from scientific grace....in 2007 Watson made an incendiary remark regarding the intelligence of black people that lost him the admiration of the scientific community. Neither the Faustian spirit nor the fascination with tools is universal among our people, of course. The Faustian spirit is essentially a masculine spirit, and it often is at odds with both the feminine spirit and the mercantile spirit. When our society is virile and forward-looking and willing to take chances, the Faustian spirit is dominant. When virility is in decline, and we become more interested in comfort and self-indulgence and security and conformity, then the Faustian spirit in us -- in our society, in our civilization -- also is in decline. Well, everything I've said so far today is by way of introduction to a couple of really depressing illustrations of the decline in virility in that segment of our society that in healthier times was on the cutting edge of our climb upward toward the stars and was the purest embodiment of our Faustian spirit -- and that is our scientific/academic segment, the seekers of knowledge and understanding. Let's begin with something everyone has heard about very recently: the mapping of the human genome: which is to say the determination of the sequence of the basic building blocks in the long strands of human genetic material that determine what we are. That is certainly a grand and worthwhile project, even if it is more a massive application of technology than a scientific breakthrough. And to me it really is depressing to have to note that some of the people involved in this grand project are so much in the grip of Political Correctness that their ability to do meaningful or valid science is in real doubt. 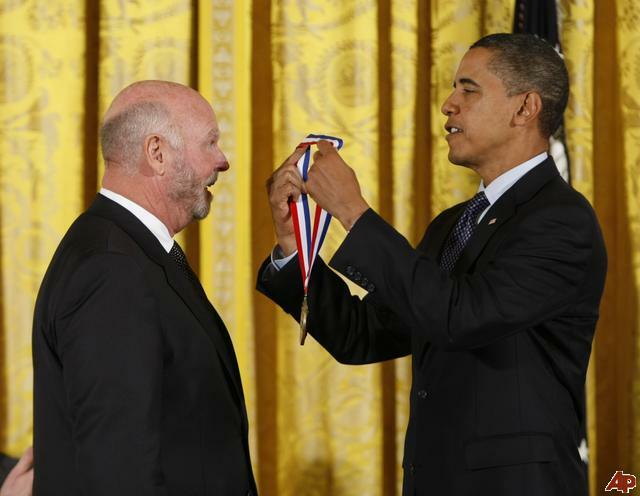 One of the actors in the genome mapping project is J. Craig Venter, who is the president of a biotechnology company called Celera Genomics Corporation. Mr. Venter and his company hope to make lots of money from their genome mapping work by selling the results to pharmaceutical companies. And Mr. Venter also wants to be very sure that his company is in the forefront of Political Correctness as well as biotechnology. At a White House ceremony a few days ago, in which several of the genome project's leaders met with Bill Clinton to make a public but somewhat premature announcement of the completion of the project, Venter used the occasion to tell the world that his company had used DNA from five individuals in its mapping work, and among those five were a mestizo, a Black, an Asian, and a White. The choice of DNA donors had been made, he said, "out of respect for the diversity that is America and to help illustrate that the concept of race has no genetic or scientific basis." Really. Blacks are not Blacks for genetic reasons but because of poverty and discrimination, I suppose -- or to be really Correct, Blacks are different from us only because of White racism, not because their genes are different. This would be a good topic for an ADV. (NEWSER) – Nobel laureate James Watson, famous for co-discovering DNA and infamous for his theory that black Africans are less intelligent than whites, turns out to have a genetic profile with 16 times as many black genes as the average white European, the Independent reports. Watson's genes are said to be comparable to someone with an African great-grandparent. "It was very surprising to get this result for Jim," said the geneticist who analyzed Watson's DNA. In addition to 16% African genes, tests of the scientist's DNA showed 9% of his genes are Asian. The outcry over Watson's racial theories this year forced him to step down from his long-time position as chancellor of a New York laboratory. Poor Watson must have been tested by the same outfit that said Craig Cobb is 14% African. if there was ever any proof that the Jews can shun and completely ostracize anyone from society just for speaking the truth, or even what they believe to be the truth, so long as it's politically incorrect than this is it with James Watson. It's funny how they always end up saying that the DNA of people who said racist things appear to display an abnormal amount of African DNA. I think whoever did these DNA tests put there thumb on the scale or something. DanielOlj79 wrote: if there was ever any proof that the Jews can shun and completely ostracize anyone from society just for speaking the truth, or even what they believe to be the truth, so long as it's politically incorrect than this is it with James Watson. James Watson, the molecular biologist who has become nearly as famous for his unfiltered, off-colour remarks as for his role in the discovery of the double-helix structure of DNA, has achieved another scientific milestone. On 4 December, he became the first living scientist to auction his Nobel Prize medal to the highest bidder. The anonymous buyer paid US$4.76 million, participating by phone in the sale held at Christie's auction house in New York City. That is the highest price ever paid for a Nobel medal, far outstripping predictions that Watson's prize would sell for $2.5 million to $3.5 million. The sale comes more than a year after the family of Francis Crick, who shared in the 1962 Nobel Prize in Physiology or Medicine with Watson, sold his medal for $2.27 million. "I'm very pleased," Watson said after the auction. "I wanted to be at least equal to Crick, but this exceeded his." Whereas Crick remained a relatively private person until his death in 2004, Watson is a notorious rabble-rouser who is not shy about voicing his views on race and gender. 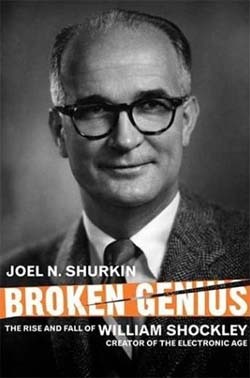 In 2007, he was fired from his long-time post as chancellor of the Cold Spring Harbor Laboratory in Long Island, New York, after suggesting to the Sunday Times that blacks are not as intelligent as whites. "Our wanting to reserve equal powers of reason as some universal heritage of humanity will not be enough to make it so," he said. Watson told Nature that his motivation for selling the medal is a chance for redemption. He plans to donate some of the proceeds to Cold Spring, where he still draws a $375,000 base salary as chancellor emeritus, and also to University College Cork in Ireland to help establish an institute dedicated to the mathematician George Boole. "I'm 52% Irish," Watson said by way of explanation. He previously told the Financial Times, perhaps in jest, that he might also buy himself a David Hockney painting. 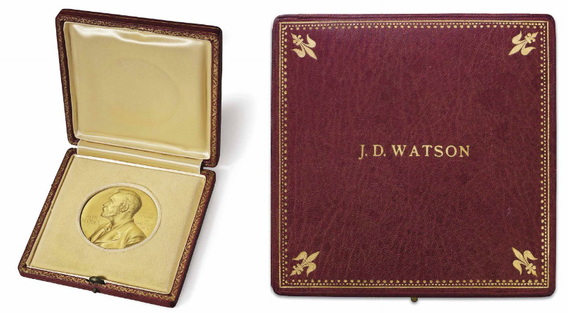 In addition to the medal, Watson also auctioned off notes from his Nobel acceptance speech — scribbled on stationery from the Grand Hotel in Stockholm — and lecture. The speech sold for $365,000 and the lecture for $245,000. A lot better than being burned at the stake or waiting for an apology for 350 years. William Shockley's Nobel Prize wold probably fetch even more than Watson's if there's any correlation between its worth and the notoriety of its <gasp!> "racist" winner. "Stupidity is a genetic disease"
(CNN)A Nobel Prize-winning American scientist and DNA pioneer has been stripped of his honorary titles at the laboratory he once led after repeating racist comments in a documentary. James Watson, who helped discover the double-helix structure of DNA alongside Francis Crick in the 1950s based on the work of British chemist Rosalind Franklin, said in a PBS film that genes cause a difference in intelligence between white and black people in IQ tests. The 90-year-old's comments were labeled "reprehensible" by the Cold Spring Harbor Laboratory (CSHL) on New York's Long Island, where Watson had been the director from 1968 to 1993. The laboratory said it "unequivocally rejects the unsubstantiated and reckless personal opinions Dr. James D. Watson expressed," noting the statements were "reprehensible [and] unsupported by science." "The Laboratory condemns the misuse of science to justify prejudice," its statement added. Watson had previously told Britain's Sunday Times newspaper in 2007 that he was "inherently gloomy about the prospect of Africa" because "all our social policies are based on the fact that their intelligence is the same as ours, whereas all the testing says not really." The scientist added that while he hoped everyone was equal, "people who have to deal with black employees find this is not true." While Watson apologized for the comments in 2007, he said in the PBS documentary "American Masters: Decoding Watson," which aired on 2 January, that his views had not changed. In 1997, Britain's Sunday Telegraph quoted him as saying that women should be allowed to abort a child for any reason, such as if a gene for homosexuality were found in the fetus. During a lecture tour in 2000, he suggested there might be links between a person's weight and their level of ambition and between skin color and sexual prowess. "That's why you have Latin lovers," he said, according to The Associated Press, which cited people who attended the lecture. "You've never heard of an English lover. Only an English patient." The Semitically Correct yahoos running that laboratory have no honor, therefore any 'honors' that they strip from Watson are meaningless. The man should be given a life rune to honor his courage in stating the truth.